And wow, do I love the whimsy of filling plastic eggs with delicious candy, dipping rows of stark white hard-boiled eggs into vibrant colors, hunting for hidden treasures amongst tall blades of grass, etc. We keep the playful side of Easter pretty innocent in our home…..and enjoy the tradition of giving/receiving baskets of treats and wearing new spring outfits. But along with that, I always enjoy adding a few new spring decor pieces to a shelf or an end table. It cheers the whole room up. And reminds me that my favorite time of year has come. And what would spring be without color and a ruffled egg? I bought this fabric for a different project but borrowed a bit for this framed egg. If interested, I bought this fabric here. Would you like to add an egg to your table or shelf this spring? 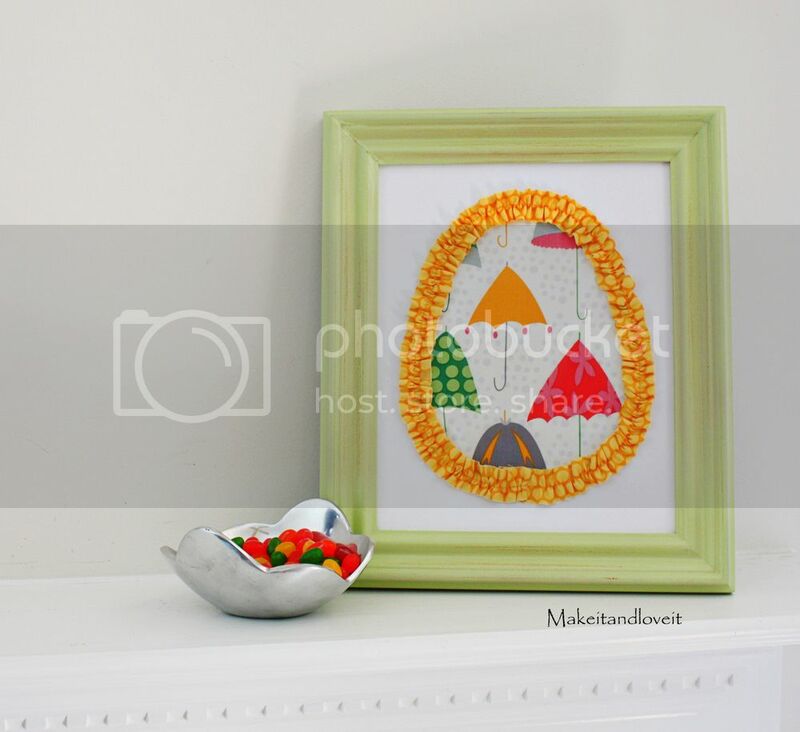 Find a frame that will work for this project (mine is an 8 x 10 frame) and cut out an egg out of paper. Then use that as a pattern as you cut the same shape out of fabric. Then I cut a strip of fabric that was 1 x 45 inches. Then I sewed a basting stitch down the center of the strip, making sure to not back-stitch at either end. Then, starting at the bottom, I carefully hot-glued the ruffle around the edge of my egg. I worked my way around the top…..
…..and then down to the bottom. Then I tucked the end of the ruffle under and glued it down, covering the raw edge of the other end. Nice and colorful and a sweet little companion to a bowl of jelly beans. Need some easter/spring ideas from past projects? Check out this post, this one, this one, and this one. Oh, I love the fabric too! What a cute, cheery spring display! Love it! Seriously cute! And such an easy way to add some seasonal fun! Wow. that is so cute and simple. I love it. And I love the fabric choice. My good friend actually designed that! Rainy Days and Mondays is her little baby. So I'm glad you used her fabric! I emailed her about this cute post too! i love this fabric!! i just won it on the 44 street fabrics giveaway actually! i can't wait to receive it! I love it!! And the umbrellas are so springy (especially with how much rain we've gotten here in GA lately!). What a cute, fresh idea! I wish I had some fabric just like this! I'm going to go through mine or hit the fabric store before I pick up kiddos! I love this – the ruffle makes it! Love the bright cherry colors. two of your readers (Lyssa was one of them!) 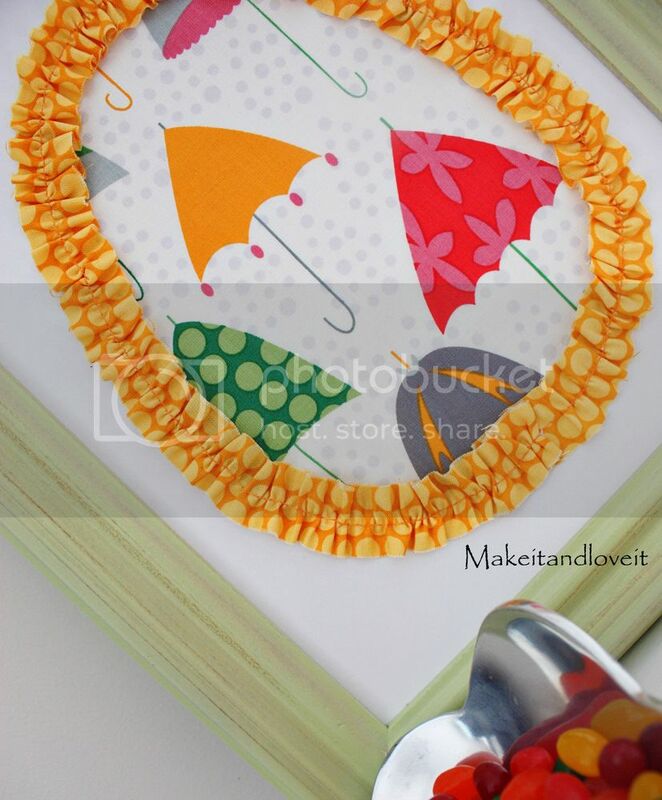 told me about this post where you used our Rainy Days and Mondays fabric! WOW! What a FUN idea!! Very cute! I might just have to link up from my blog to yours to show people the clever idea you had! That is cute and a classy simple project! So easy and cute! I love this! This turned out so great! Thanks for the great tutorial!! Adorable, festive, and easy… perfect! :) Thanks for always inspiring. Adorable. Do you ever sleep or do you dream in fabric swatches and paint chips like I do? Keep the ideas coming.. then I will have more to dream about. Absolutely love the fabric! What was the project you orginally used it for? I would love to see pictures of that. 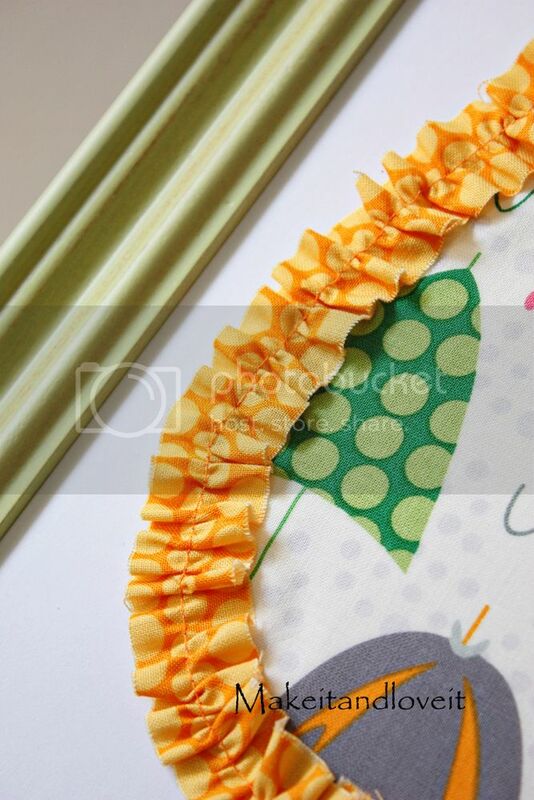 My mom and I adapted this… she demos for Stampin' Up so we made it using printed paper and ribbon trim. Thanks again for a fun project!! I love your easter craft, so simple. And I am in LOVE with that fabric line, my good friend designed that line, "Rainy Days and Monday", so awesome to see you using it! !